Walk to the beach and central Coolum. 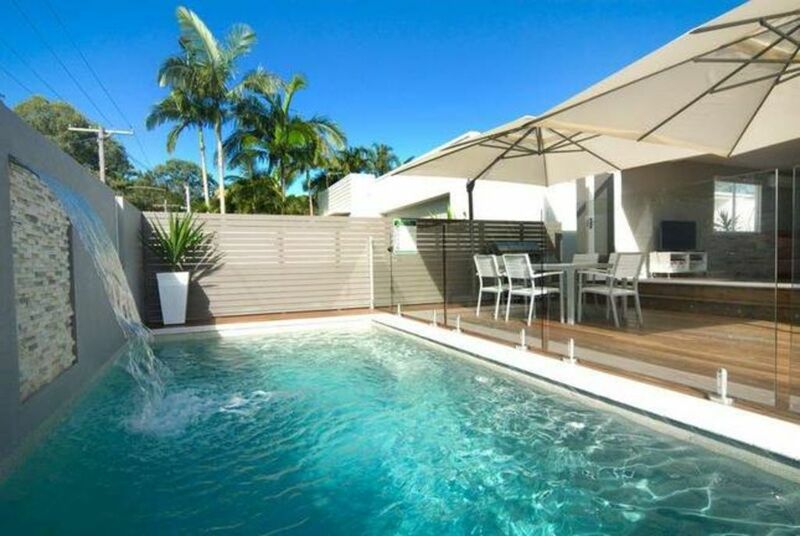 This home offers an ultra modern finish in a quiet leafy street right in the heart of Coolum Beach. Cable TV including sports channels, a DVD library, unlimited wifi and music dock have all your entertainment needs covered. The open plan living area offers views of the swimming pool and timber deck through bi fold doors. Outdoor entertaining is easy with a BBQ, dining table and sun lounges. The stylish kitchen is fully equipped, including large fridge with auto ice and water, extra large 900mm oven, gas cook top, microwave and island breakfast bar with granite tops. 4 large bedrooms (2 queen, 1 double, 2 singles) plus an optional bed space in the lounge sleeps 8 in total. The private master suite includes a modern spacious en suite bathroom, walk in robe and private deck. A completely separate media/family room allows the kids to watch DVD's and play games while parents can relax in peace in the living area. Automated sliding gates and double auto garage give security and privacy. There is a studio flat in the rear garden completely away from the main house that is rented to a quiet young girl. She has a separate entrance and works during the day so you are unlikely to even know she is there. The studio is screened from the beach house for privacy. There is no access to the main house from the studio. Pets welcome - please inquire for further information. I've been in the accommodation industry for more than 20 years and grew up in a Bed and Breakfast in Wales. I have 4 properties in central Coolum that I have renovated and turned into holiday homes. I have 2 children and we love to travel and enjoy surf and snow holidays. I didn't leave any of this on the maintenance report because it was clear that nothing had been done before. The decor in the place has clearly been thought about and gives the place a nice feel. If they fix up all of the above it will be ready to go! Thank you for taking the time to write your thoughts on the maintenance issues you had during your stay. I'm glad that you didn't let these things spoil your holiday. I would have been able to solve most of them if you had let me know there was a problem. To any future guests reading this please contact me if you have any issues or if you need extras provided - I will do my best to provide what you need, and have often loaned guests my own equipment and kitchen appliances if they have asked. I did respond to your request about the fridge, and came to see if I could resolve the issue - at peak periods it is difficult to get a technician to attend. I offered to buy ice for you but you declined. Things do break from time to time and are fixed as quickly as possible. If anything is bothering you then please let me know so that I can do something about it while you are there. Usually when guests fill in the maintenance notes they leave them on the kitchen bench so that I can read them - the note you are referring to was left tucked into the back panel of the compendium and wasn't found until a week later. House was amazing would definately do again if we had the money! Just a few things though. We booked for 8 people but seating was only for 6. Was also only 6 water glasses. Also it stated there was a fold out couch which it didnt seem there was, also aircon wasent in one of the rooms... but other than those minor things everything else was amazing! This is such a beautiful house in a wonderful location so near town. We thoroughly enjoyed our stay, everything was setup and made very easy for us. It was a very beautiful and atmospheric house. we thoroughly enjoyed our stay at Tradewinds Avenue, Coolum Beach. Fantastic communication with owner. I love this place. Comfortable, clean, good location.. everything all right. If i have any plan to visit sunshine coast i will stay again.